Echeveria michihuacana (Crassulaceae), a new species for science, is described and illustrated. 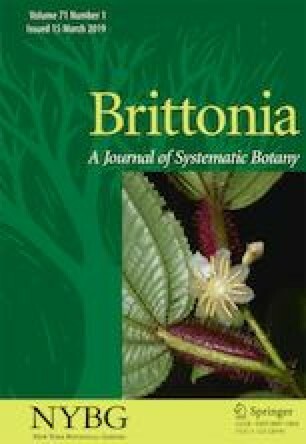 The new taxon is related to a group of species of Echeveria series Gibbiflorae from western Mexico, including Echeveria dactylifera, Echeveria fulgens, Echeveria patriotica, and particularly the recently published Echeveria pistioides. With the last species, E. michihuacana is similar in the shape and coloration of floral structures, as well as in its geographical distribution. In contrast, it differs from all of the aforementioned related species in having an evident stem, larger panicles and flowers, deep-red nectary scales, and absence of appendages on the inner side of the petals. Se describe e ilustra a Echeveria michihuacana (Crassulaceae) como nueva especie para la ciencia. El nuevo taxón está relacionado con un grupo de especies de Echeveria de la serie Gibbiflorae del occidente de México, incluyendo Echeveria dactylifera, Echeveria patriotica, y en particular, con la recientemente publicada Echeveria pistioides. Con esta última comparte la forma y coloración de las estructuras de la flor, así como su distribución geográfica. En contraste, difiere de los taxones relacionados por presentar un tallo evidente, panículas y flores más largas, escamas nectaríferas rojo intenso y por la ausencia de apéndices en la cara interna de los pétalos. Financial support was provided by UNAM-DGAPA-PAPIIT [project IN212015] and CONACYT [project 247078]. The first author received graduate studies scholarships from Posgrado en Ciencias Biológicas, UNAM and CONACYT. We thank an anonymous reviewer and Dr. Joachim Thiede for helpful comments on the manuscript. Echeveria dactylifera: SINALOA: Durango-Mazatlán highway, Espinazo del Diablo, J. Reyes S. 6274 (MEXU). Echeveria fulgens: ESTADO DE MÉXICO: Mpio. Amanalco, volcanic rocks 1 Km south of San Juan Amanalco, 2340 m, Quercus scrub, A. García-Mendoza et al. 6123, 8 Dec 1995 (MEXU); Michoacán: Mpio. Zitácuaro, 3.78 km north of San Felipe de Los Alsati. 19°31′20.1”N, 100°21′59.7”W, 2147 m, pine-oak forest, D. Álvarez et al. 14,683, 17 Nov 2014; between Cd. Hidalgo and Mil Cumbres, km 232, old México-Nogales highway, C. Delgadillo 12, 15 Dec 1965 (MEXU); mpio. Zacapu, west of Angostura, matorral pedregoso, A. Grimaldo 422, 18 Nov 1988 (MEXU); mpio. Uruapan, malpaís (lava fields) of Capacúaro, forest of Quercus, 2250 m, E. Pérez-Calix 3544, 9 Dec 1996 (MEXU); mpio. Pátzcuaro, 2 km southeast of Cerro del Estribo, oak forest, 2230 m, J. Espinosa 2436, 8 Dec 1986 (MEXU); mpio. Zacapu, El Pinal, near Santa Gertrudis, oak foresto n basaltic lava stream, 2100 m, H. Díaz y A. Grimaldo 4498, 6 Nov 1987 (MEXU); Morelos: Mpio. Huitzilac, ± 1 km southwest of Huitzilac, pine-oak forest, on volcanic rocks, 2550 m, E. Pérez-Calix & I. García 3966, 25 Oct. 1999 (MEXU). Echeveria patriotica: Michoacán: between Palo Dulzal and Palo Herrado along road from Quitupan to Santa María del Cerro, 2322 m, J. Reyes S. 6813 (MEXU). Echeveria pistioides: Michoacán: Mpio. Tzitzio, aproximadamente 1 km al SE de Piedras de Lumbre, 1950 m, J. Etter y M. Kristen 4191 (MEXU).